The Canine Sports Facility and Event Center would include daily member usage and up to “24 event days” per year. In addition to several trailers for use as an office, and for members, storage and restrooms, there would also be a fenced field, parking area and walking paths. The project applicant is Wolter Properties LP. The project requires a combined development permit for the canine training/sports facility and design approval. The Board of Supervisors granted the appeal and unanimously denied the project October 27, 2015. The Planning Commission approved the Facility in August 2015. The Planning Commission Staff Report (28.7M PDF file) recommends approval of the project at the August 26, 2015 Planning Commission hearing. The County released a Final Environmental Impact Report (29.2M PDF file) for the project in August 2015. The County released a Draft Environmental Impact Report (11.2M PDF file) and Appendices (10.4 MB PDF file) for the project in April 2015 with a 45 day review/comment period. 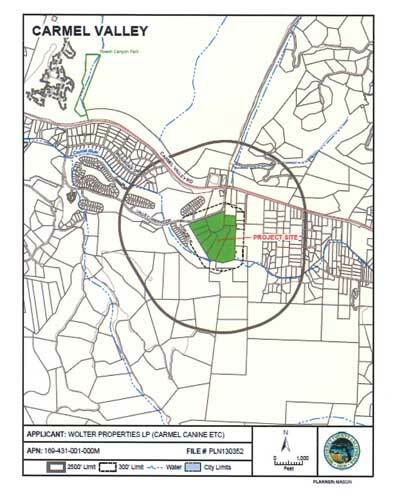 The County released a Revised Notice of Preparation (78k PDF file) for the project with comments due January 9, 2015. The County released a Notice of Preparation (78k PDF file) for the project with comments due January 2, 2015. The County released a Mitigated Negative Declaration (9.8M PDF file) for the project in December 2013 with a 30 day review/comment period. The Canine Sports Center will be located off Valley Greens Drive. Credit: County of Monterey, Canine Sports Center MND (December 2013). Staff stated the project applicant had not agreed to the mitigation measures limiting use of a sensitive riparian area, but the project clearly states the riparian area will be used. Monterey County Zoning restricts use of a site in a Low Density Residential setting to 10 events per year and this project proposes 24 per year. The regional roadways impacted by the project are not identified in the document and therefore without identification the impacts can’t be mitigated below a level of significance. The Department recommends that the MND be withdrawn, and a revised CEQA document be prepared and circulated for review once adequate surveys and impact analyses have been completed, and after a water right for the project has been identified and perfected by the project proponent.